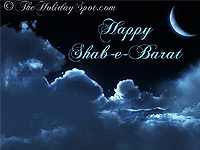 Shab-E-Barat falls in the month of Shaban, which is the 8th month in the Islamic calendar. Traditionally, this month is also called the month of Separation, as the Arabs used to leave their families and wander in search of Water. 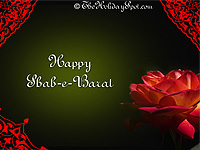 In Arabic language, Shab E Barat is known as Lailatul Bara'at, meaning the night of emancipation. The event falls in the 15th night of the month, and 14 or 15 days after, it is Ramadan. It is believed that Allah forgives the past sins and allows for a prosperous future for those who asks for it at this time with their prayers. The day is meant for fasting, while the night for prayers and celebrations. At this time, houses are decorated with candles and electric lights, while the skies are lit up with fireworks. 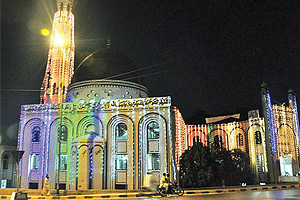 Know How Shab-e-Barat the muslim festival of lights is celebrated. Acquaint yourself with the Shab-e-Barat prayer. 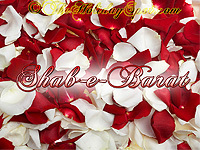 Adorn your desktop with wonderful Shab-e-Barat Wallpapers. Send wonderful greetings made just to mark the occasion. 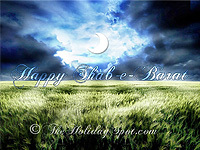 Shab-E-Barat is the Muslim festival of lights. Celebrations are carried out thoughout the night, and it is customery to stay awake the whole night of the festival. Houses are cleaned and decorated with chains of lights and candles. The mood is very festive and the clusters of decorated houses look beautiful in the shimmering lights. Fireworks abound this time, and people burn fireworks relentlessly all through the night. It is done as a salute to God, as it is believed that God write the destiny of all living beings for the coming year. The colorful skies are a spectacle to behold on this night. The festive spirit also extends to cullinery delights. Sweets, especially the traditional Simai or vermicelli is in the must prepare list of every household. It is sent to all friends. Frequently, feasts are also organized for eating together. It is also the time for charity, and clothes, foods and other commodities of daily use are given to the poor and needy. The deceased ancestors are also remembered at this time. Their graves are adorned with flowers at this time. The time is also for prayers. Blessings are recited at the time of meals in the name of the Prophet, his daughter Fatima and her husband Ali. Some pious Muslims pray throughout the night, as it is believed that if you pray for the whole night asking for forgiveness for the sins committed during the year, you may be forgiven. One also asks for the good fortune for the upcoming year. Some also fast during the day. Quite a few opt for the Nafal, or the optional evening prayer. Please note that this festival is not accepted by all muslims, and many restrain themselves from celebrating it. This is because there is no mention of this event in the Holy Quran. But Sura Dukhan does mentions about Laila Mubaraka, which according to learned scholars, is, Shab-E-Barat. Read 6 rakaat Nafl prayer (2+2+2), after Magrib. After every two rakaats read Surah Yaseen once. This prayer is asking for a healthy and prosperous life for the whole year, from the Almighty. Read 8 rakaat nafl prayer with one salaam only. Surah Fatiha once and Surah Iklas: 11 times. Allahumma inni al-aloka afwa wal afiyata wal muafatad-daimata fid dunya wal akhirah. May Allah shower His blessings on you and your family.